Recently, while the whole world looks completely hyped up with Web applications, we chose to design and develop a desktop software in Qt/C++. Obviously, the choice was measured and justified ! We had to build a specific GIS application with complex interactions and huge amounts of data, for a limited number of users. 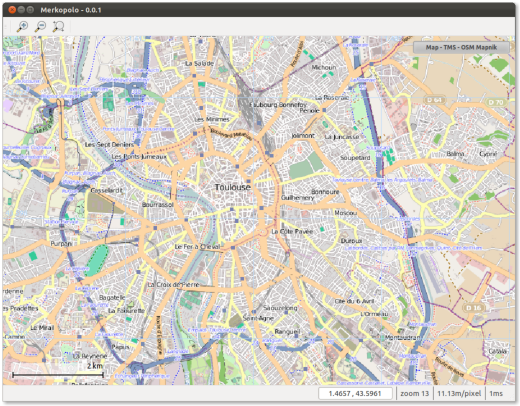 Quickly, we spotted Merkaartor, one of the official OpenStreetMap editors, for its UI components and object model. And since we started to code, we never regretted this choice ! C++ brings the power, Qt offers cross-platform and the compassion towards developers, and Merkaartor a lovely GIS flavour ! We contributed to Merkaartor to give gits components a little bit of genericity, and released Merkopolo, a Qt project skeleton to handle dependencies and inclusion of base components. And even draw geometries from PostGIS database ! Merkopolo is available on Gitorious.